Buy your ticket for the Notre Dame Raffle with a grand prize of $50,000! Total of 17 cash prizes will be awarded. Drawing party is Sunday, April 28, 2019. Welcome to Notre Dame Schools, located in Utica, NY. Our independent and private school system encompasses Pre-Kindergarten through Grade 12, including Universal Pre-K and Montessori Pre-K. We are home to a community of more than 400 students enriching their lives through the principles of Catholic education. With more than 180 years of tradition lining our school’s hallways, we pride ourselves on providing tomorrow’s young men and women with a value-centered and academically challenging environment. Notre Dame Schools Catholic setting and incredible faculty provide every student the tools to develop their unique gifts. We mold and educate our students to become outstanding leaders in the classroom, the community, and the Catholic Church. 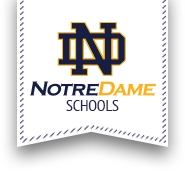 For more information on how your child can become part of the Utica Notre Dame community, please schedule a visit or contact us today.